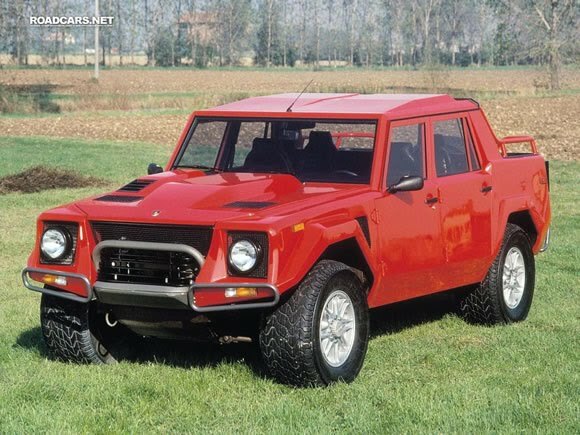 The Lamborghini LM002 makes the Hummer look seriously anemic. When Lamborghini decided to try and break into the Military market they did it in real style. After two attempts that didn't go so well they came up with the LM002 and immediately sold a lot of them to the Saudi Arabian army and Libya. Great. Not many people could get the smile off their face after driving this brute with run flat tires, 76 gallon fuel tank, a 400+hp Lamborghini Countach V12 and 145mph top speed. It didn't take off as a military vehicle so it got sold to us normal folks. Well sort of normal. The car was nick named the Rambo-Lambo and Sylvester Stallone even owned one for awhile. Civilian models had air conditioning, tinted windows, leather and a great stereo mounted in the roof. All up about 300 were sold. The 80's were a great time for beautifully over the top vehicles. I'm sure I would get some bad looks driving this through Auckland, and probably would have to re-mortgage to pay for the fuel, but .... it would be cool. Watch a video of one here. Sounds great. Claude Lelouch's "C´etait un rendezvous"